Detroit’s Trash Brats hit the bullseye with their hottest slab of silver, “Out of the Closet”! Righteous gutter glam. 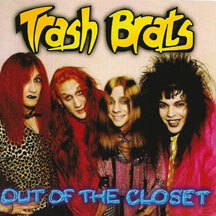 Thee Trash Brats were (and still are) legends of the style of hammerjack guitar, harmonic vocals and sing-along pop rave-ups, all the while wearing dresses and nail polish! Don’t let the looks fool you, the closet these guys emerged from housed manly tools! This release, due June 2nd on Circumstantial Records, features nasty recorded versions of their live staples, Out of the Closet is now, well, back out of the closet! An exciting rock n’ roll reissue from the unsung, but well hung, Detroit heroes – the Trash Brats!